Whenever It's a Trap! is exposed, do 2 net damage. subroutine The Runner trashes 1 of his or her installed cards. Trash It's a Trap!. Stage 1: [reads the card for the first time] "WHOA THIS IS GREAT"
Stage 2: [re-reads the first sentence] "Wait... when exposed? This doesn't seem that great." Trashing a program for a click and two credits is good value, but it's the runners choice, which severely limits the punch in the mid and late game. Also, if there is a Crypsis or Overmind on the board it is worthless. At 3 influence, it's not even likely to be splashed, so there is no surprise factor with it being played out of faction. All in all, a very weak trap, although the flavor is fun. Real good against 419: Amoral Scammer and GPI Net Tap. Just like Psychic Field. Uh. It's also highly inconsistent. Just like Psychic Field. This card is probably never worth rezzing. It's on expose effect is the only worthwhile thing about it. How does accessing archives work? Are upside-down cards "Exposed" at time of access, then selectively accessed, or are they simply in limbo waiting to be "Accessed"? Wondering how this would interact with something like Industrial Genomics. ...but wait, what's that I see there on the Martian horizon? 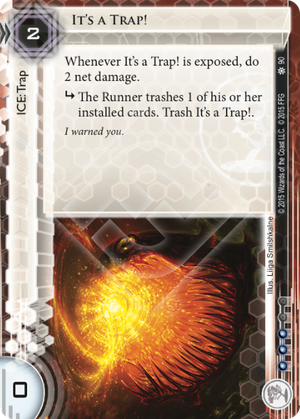 tl;dr - It's A Trap has some potential in an Aumakua-heavy meta, and synergizes well with Jinteki's native ice-shuffling cards to make the Runner nervous about running. However, it's still not that great. I would say the changes in the current meta have maybe bumped it up from 46th card to a maybe-include for a specialized Chronos Protocol or Potential Unleashed deck.